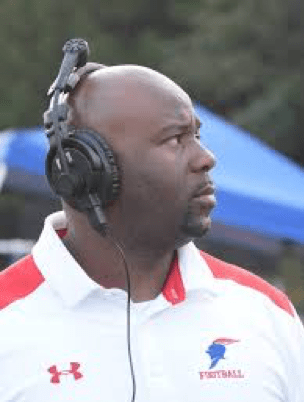 Riverwood International Charter School Coach Robert Edwards led the Raiders to an impressive 8-3 record this season, finishing 2nd in 5A’s region 5. The tremendous season included a 6 game winning streak to end the regular season, averaging 43 points on the year. This is Coach Edwards’ first season as a head coach at Riverwood, taking over resurrecting a Raider team that went 2-8 the year prior. Prior to his arrival, Riverwood has only made the playoffs 3 times in the prior 30 years. The Raiders have only won 8 games 1 other time in the past 30 years. You may also remember coach Edwards from his days wearing #47 for the Georgia Bulldogs or as a member of the always fierce Washington Co Golden Hawks prior to his time in Athens.